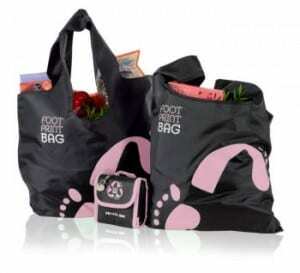 Footprint Bags are an ingenious product range created by two environmentally-aware young mums, Hanny and Claire. When Hepden Bridge in Yorkshire, near where they lived, decided to become a plastic bag free town this sparked an idea, and 3 years later a fabulous and practical product – the reusable shopping bag pack. I still get excited at the anticipation that comes with expecting a parcel – especially a product for review. However, this time when the postman knocked with my parcel – a sleek and shiny black jiffy envelope – even my husband was intrigued. Inside the lovely packaging continued – wrapped in black tissue was my new 4 bag Footprint Bags pack. Smaller than I had anticipated, the pouch is secured with Velcro and contains 4 reusable bags – and the really clever part – a trolley coin attached to the handle so when you are shopping it hangs discreetly off the back of the trolley. The reason for getting the smaller of the 2 was I was thinking about ‘going in to town’ trip, or to keep in the glove box of the car so when I stop to pick up some essentials on the way home I always have bags. Normally dreading the supermarket I had a lighter than usual step as I set out to road test the bags. Firstly – massively less bulky to carry than the hessian/cotton/plastic bag for life ensemble I usually cart in with me – and just hang neatly off trolley or sit discreetly in corner. Then came the real test – would they hold enough? In fact they are a great size – larger than a carrier bag – but not so large you can’t then lift them up! The shape is great and very flexible, and the handles are wide and strong. Even the checkout commented on what a great idea and how neat they were. Carrying the bags from the car up the garden path revealed another advantage –the material the bags are made of means that the handles don’t cut into your flesh – even when heavily laden – result! One of the best and most practical products I have used this year – real thumbs up. I just need an 8 pack one now for the weekly shop – 4 just aren’t enough. I stock these bags and they have been really really popular. Thanks for the wonderful review! Glad you liked the bag packs. Wow these look fab – I’ve just ordered some as I was stuck for a present for my dad (he normally does the shopping!) and some for us to keep in the car incase we’ve forgotten to put the usual canvas bags back!